This week we take a look at the increasing trend of retirees investing in P2P Lending to supplement their retirement income and three important tips to maximize those investments. More and more over 55s are becoming money lenders as a way to fund their retirement. But we’re not talking about loan sharks here – instead they’re spurning high street bank savings accounts with low interest rates to join the P2P revolution. The number of people at retirement age investing their money with Peer-to-Peer lending providers increased by 84% globally last year, according to RateSetter, a leading P2P platform. People near retirement are looking for ways to get a better monthly return on their cash and P2P can help them achieve this. 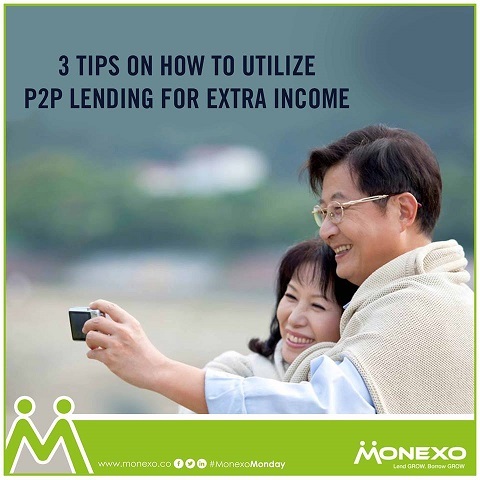 Below are three tips for retirees on P2P Lending to earn some extra income. 1. Find a platform you trust. Look for a platform that has clear and transparent underwriting procedures, experience in the space, and proper infrastructure around servicing. Research the processes of a particular organization thoroughly and compare with other platforms before contributing your hard earned money. Monexo provides a detailed Lenders FAQ section to help lenders stay aware of all that comes with taking a p2p loan on the Monexo platform. It’s important to remember that some borrowers might not be able to repay their P2P loan. Building a diversified pool of loans is probably the safest way to make money in this new category. On a granular level, this simply means lending across a number of businesses (or consumers needing money), so you are only lending a small amount to each one. 3. Don’t let returns sit idle. As principal and interest payments trickle in from your investments, ensure these returns are automatically or manually reinvested into new loans so you can further diversify and earn greater overall returns. As always, every borrower - whether a business owner or individual - has different objectives. If unsure, it would be prudent to speak with a financial advisor who can help you balance your tolerance for risk with your appetite for yield to build the optimal investment portfolio for you, one that will support you in retirement.